The following section outlines the requirements for proper TradeStation to NinjaTrader symbol mapping when using the Automated Trading Interface (both DLL or Email interface) and/or using the TradeStation's market data through the External Data Feed Connection for simulation. Note: Mapping is NOT required for stocks or Forex symbols. For this example, let's map the "ESM14" contract. 1. From the NinjaTrader Control Center window select the menu Tools and select the Instruments menu item. 2. Highlight the ES contract from the main grid which is the NinjaTrader S&P 500 Emini contract. 3. Press the "edit" button to bring up the Instrument window. 5. 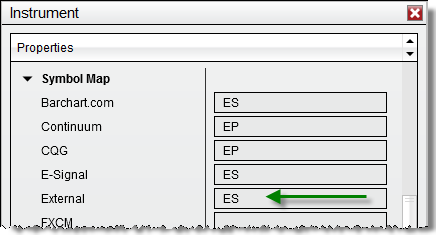 In the Symbol Map category for the External data feed set the value to "ES". 6. Press the "OK" button. * The symbol map name "ES" in the image below needs to be the TradeStation symbol base name. This procedure would be repeated for any other symbols you wish to map between TradeStation and NinjaTrader. For automatic mapping, follow the instructions above for "How to map an individual futures contract" otherwise follow the instructions below. If you run the TradeStation Automated Trading Interface through the email protocol or want to use the NTExternalFeed strategy to drive NinjaTrader Simulation Edition with a TradeStation continuous contract, follow the instructions below. We will use the "@ES" continuous contract symbol and front month of June 2014 for example purposes. 5. 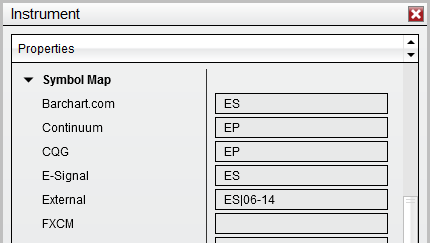 In the Symbol Map category for the External data feed set the value to "ES|06-14". * The symbol map name "ES|06-14" in the image below needs to be the TradeStation symbol base name. Automated Trading Interface - Orders generated for "@ES" will now be routed to the NinjaTrader "ES 06-14" contract. NTExternalFeed strategy - Data from your "@ES" chart will be sent to the NinjaTrader "ES 06-14" contract. Please remember to change this when the contract rolls over.